BATTLE OF WATERLOO. 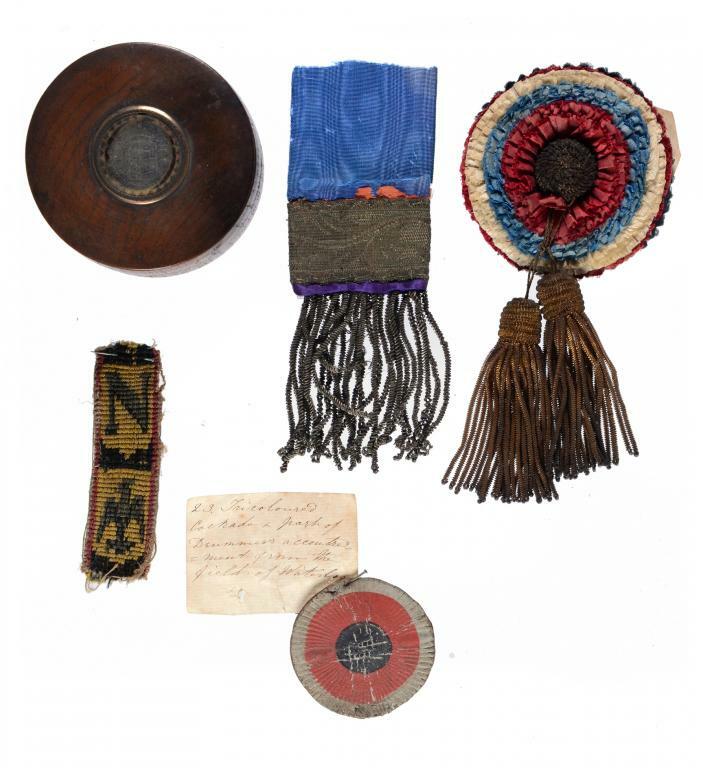 FIVE NAPOLEONIC RELICS, C1815 comprising a fragment of woven woollen trimming with the imperial N and eagle in dark blue on a yellow ground, a woven metal thread fragment with tassels, a tricolour cockade of painted paste board bearing 19th c handwritten label "Tricoloured Cockade & part of Drummers accoutrement from the field of Waterloo", another of red, white and blue ruffled cloth with metal thread centre and two tassels labeled "Waterloo Cockade" and a box and cover made from Napoleon's willow, inset with a silver coin, 9cm diam, labelled "Box made from the Weeping Willow tree over Napoleon's grave at St Helena. There was a small miniature of the King of Rome on the lid, but it was stolen. Presented to me by the Miss Rochforts Dec 5th 1915"Provenance: (The first three items) almost certainly acquired by Captain Digby Thomas Carpenter (1780-1853).A similar painted cockade removed from a French soldier lying on the battlefield of Waterloo by an English clergyman is in the Curzon Collection in the Bodleian Library, Oxford.